Indeed there are no other references than the Syger Sprites directly from the game..and those are not really detailed and very small since they are from a Game-Boy game too. If you ask me..Malfey did an outstanding artwork and i am totally look forward to see what this young artist comes up with in the future! She also participated in our other big Art Project on Game-Art-HQ now, the Final Fantasy Those Who Fight Further gallery with a great Vincent Valentine (FFVII) submission! 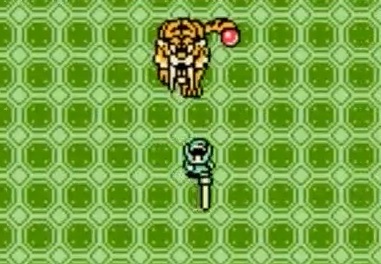 The Syger is a Sabretooth Tiger like Boss and is encountered as a Mini-Boss in the Unicorns Cave, the 5th Dungeon from Zelda: Oracle of Seasons. The battle against it is quite tricky since it rolls itself to a spiked ball and can only be attacked for 1-2 seconds when Syger makes a pause between its attacks.